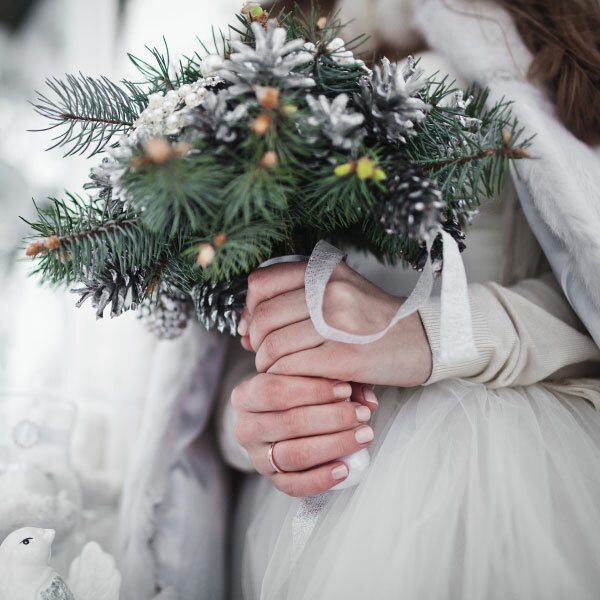 Summer is the most popular season for weddings in Italy but winter weddings are becoming more and more requested for some very valid reasons. Do you want to know why? We all know well that the wedding season is summer with its dry climate, beautiful sunny days and the opportunity to show off light and low-cut clothes for the newlyweds and guests. Weddings venues like poolside lawns, beaches, and courtyards of country estates are among the top requested. 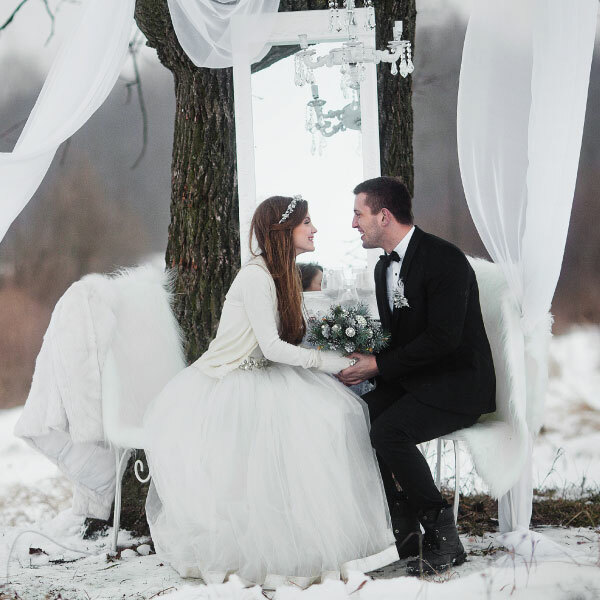 Nevertheless, there are people who cannot stand the heat or who simply love the magic of the coldest months and opts, more and more often, for a winter wedding in Italy. The winter scenery across the Alps is breathtaking. High white peaks, blue sky and the green of the woods. The scent of the forest, the colors of the earth and the red berries, the wood and the softness of the wool. These are just some ideas for a winter wedding in a country chic style that can be a very original variant for a wedding that leaves the guests speechless. For a rock’n’roll bride the classic plaid shirt can also become a top to combine with a romantic white tulle skirt. Even the groom can indulge in the winter chic country style dress and I am ready to help you with the inspiration board and the shopping. A wedding in the Alps is perfect for those couples who enjoy the outdoor living, the hiking and a hot sauna at the end of the day. Let me assist you in the planning of all the activities for you and your guests for the most beautiful winter wedding in Italy. I will take care of all the details while you enjoy the trekking and the love of your dear ones. The Dolomites are among the most beautiful mountains in Italy. High peaks over 3000 mt, forests and a rich fauna are among the interesting aspects of the area. If you choose to celebrate the wedding in Italy during the winter months, you will have to deal with very short days and therefore many hours of darkness. Although this may seem like a problem, it can actually prove to be a precious resource for setting up a reception of breathtaking elegance. How is it possible? The darkness can be illuminated by a cascade of lights, torches, lanterns, and candles of all shapes and sizes. A triumph of lights for a sparkling and super chic ceremony under the majestic Dolomites. Let’s not forget about the outdoor activities that can be experienced in the Dolomites. The Dolomiti Superski is a ski area comprising a large part of the Dolomites ski slopes, for a total of 1,200 km of slopes divided into 12 ski areas. All the guests of your winter wedding will enjoy skiing and snowboarding! Kids and beginners are welcome to start their learning on easy slopes while expert skiers will fly down the steepest of the cliffs. You will be surprised by the services available in the area, starting from delicious traditional food to spas and resorts.